Details how to access and discover exposed web services and services from PHP, generate documents and charts, and manipulate PDFs and images. Adobe® ColdFusion 9 (CF9) is a technology platform that allows developers to create web-based applications of any complexity using a set of easy-to-use tools. In addition to being a standalone server-side technology, ColdFusion also provides a number of facilities that allow you to perform tasks like manipulating PDF or Microsoft Office files, sending e-mail, creating charts, and much more—all tasks that often require expensive dedicated solutions that must be developed in-house. 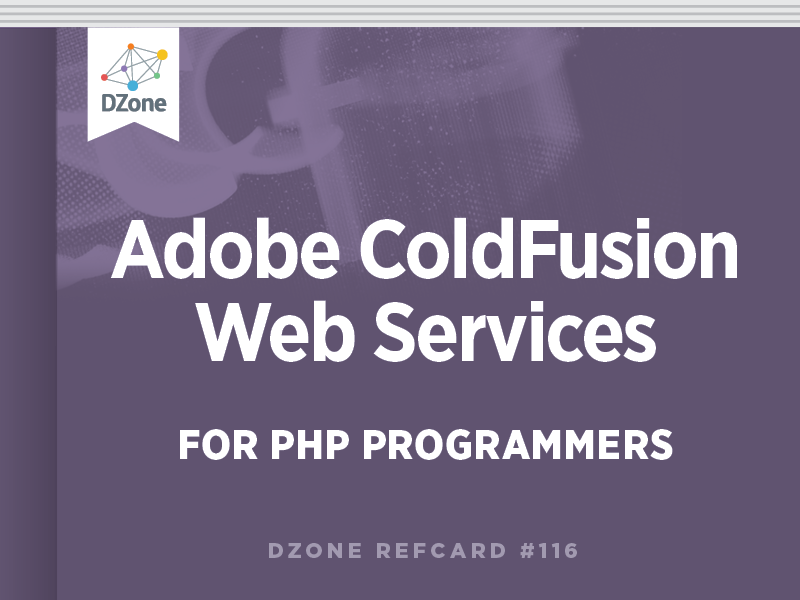 Because ColdFusion services can be deployed using a variety of standard protocols like SOAP or plain XML, you can easily take advantage of them from your PHP 5 scripts using nothing more than the standard web service facilities of the language. In fact, you can take advantage of CF9’s “Exposed Services” without even writing a single line of CFML code! Much like PHP, ColdFusion is a cross-platform product that is capable of running on a variety of platforms, including Windows, Mac OS X and any variety of Linux on which you can install a Java runtime environment. CF9 comes in two different editions: Standard and Enterprise. The latter provides a number of scalability and monitoring facilities designed for large deployments, while the former is targeted at simpler needs. Outside of these differences, however, both editions offer a comparable set of core features, which means that your CF9 server setup can grow organically without having to sacrifice any functionality—which CF9 edition you choose will be primarily dictated by the amount of traffic that you need to serve, rather than by the type of task that you need to perform. While CF9 is a commercial product that requires the purchase of a license in order to be used in a production environment, Adobe makes a Developer Edition of the platform available free of charge. Its only limitation is that it allows no more than two concurrent connections—perfect for developing locally on your machine. You can download the Developer Edition of CF9 directly from the Adobe website at http://www.adobe.com/products/coldfusion/; like the commercial versions of CF9, the Developer Edition is available for every platform supported by the product. Once you have downloaded and launched the installer, the setup process will ask you a number of questions, including whether you want to install OpenOffice, which CF9 uses to manipulate Microsoft Office documents, and whether to enable the Remote Development Service, which you should do in a development environment if you plan on taking advantage of CF9’s debugging features. At the end of the setup process, the installer will launch the Configuration and Settings Wizard, a web-based application that completes your server’s configuration and eventually grants you access to the ColdFusion Administrator, from which you can control and manipulate all your server-side settings. You don’t need to know how to develop ColdFusion applications in order to take advantage of the Exposed Services that are part of the platform. In order to access any of the exposed CF9 services, you need to first define the appropriate set of access controls. You can do so by creating a user by opening the Administrator and clicking on the “User Manager” item under the “Security” menu. Click on the “Add User” button, and then fill the user authentication form with the appropriate information. At this point, you can define which Exposed Services the user has access to by selecting them in the “Prohibited Services” list and transferring them to the ”Allowed Services” list. To finish, click on the “Add User” button and you’re all set! By default, to ensure the security of your server, CF9 precludes any client from accessing Exposed Services. You can change this setting by clicking on the “Allowed IP Addresses” item under the “Security Menu,” where you can add one or more IPs (or IP ranges) to the server’s whitelist for Exposed Services. The examples in this Refcard assume that you are running the Developer Edition of CF9 on your local machine. For deployment, you will need to alter your settings according to the make-up of your specific production environment. Some services must be configured before they can be used. For example, the Mail service requires you to specify an SMTP server before it can be used to send messages, while the Document service requires you to specify the location of OpenOffice, and so on. In all cases, you can view and modify the settings for the services exposed by your server directly from the Administrator. Exposed Services are made available through a specific location on your server; typically, if you have installed your copy of CF9 using the standard settings, this will be at http://127.0.0.1:8500/CFIDE/services/. If you point your browser to that URL, you will be greeted with a list of all the service entry points available. Clicking on a specific file will cause CF9 to output a help page that describes all the functionality provided by the service and all the available remote method calls. Complete documentation for all the Exposed Services can be found on the Adobe Help site at <="http://help.adobe.com/en_US/ColdFusion/9.0/CFMLRef/ index.html">http://help.adobe.com/en_US/ColdFusion/9.0/CFMLRef/ index.html> both in a “live” web-based version and in PDF format. Since your PHP scripts will be accessing Exposed Services through SOAP, you need access to the WSDL specification for the services you want to interface with. PHP 5’s web service libraries make accessing web services of any kind very easy. Once you have access to the WSDL, you can call any of the services directly from a PHP 5.x script by using the SOAPClient class. SOAPClient encapsulates a SOAP service and provides the means for introspecting its methods and data types, as well as performing calls against it. This indicates that the service supports a method called send() that takes a single parameter of type “send” in input and returns a value of type “sendResponse” in output. As you can see, you can leave those fields that are not required blank by setting them to an empty string; however, you must include them in the payload, and they cannot be set to NULL. If you use an IDE to edit your PHP code, you may be able to take advantage of advanced SOAP functionality such as code completion or service proxying. Check your IDE’s documentation for more information. You have probably noticed the serviceusername and servicepassword properties at the beginning of the payload: these are the credentials of the user that you defined earlier in the Administrator. Occasionally, any code can fail. It is, therefore, essential to be able to manage failure in a predictable and safe way. PHP Fatal error: Uncaught SoapFault exception: [soapenv:Server. In this particular case, you can plainly see that the failure is caused by the fact that the password provided for the service user was incorrect. In a production environment, you should always encapsulate your service calls in a try... catch code block and handle failures appropriately. The Document Exposed Service can be used to generate documents based on existing templates, or even on the contents of a web page. As you can see, the service returns a structure that contains the URL to the PDF file that was generated from the URL you provided in input. You can either redirect your client to that URL, or read the file and output it directly from your PHP file if the CF9 server is not directly reachable to the client that invoked your PHP script. The Trial and Developer edition of CF9 will place a watermark on all generated files. Licensed versions of CF9 do not have this limitation. While the example above is a bit contrived, there are many practical scenarios in which being able to create PDF files can be useful to a web project—think, for example, of e-commerce systems that must deliver receipts to their customers. As you can see, the service expects you to pass a URL to the PDF file that needs to be inspected—clearly, this location must be accessible to your CF9 installation. Upon a successful execution, this method returns a collection of objects that provide URLs for each of the thumbnails generated. As you can see, you can specify a number of different options: the output format (JPEG in this case, but PNG and TIFF are also supported), the resolution (high or low), the scale (a percentage between 1 and 100), and so on. It is sometimes convenient to be able to dynamically password-protect a PDF document—for example to provide each user with a customized version that can only be opened using his or her password. The result of the call will contain the URL to the newly protected document in a property called protectedReturn. Note that the service call allows you to specify both an owner and client password (http://createpdf.adobe.com/cgi-feeder.pl/help_security for more information on the Adobe PDF security model) as well as specific permissions that users are allowed to take advantage of. All these options are explained in the CF9 documentation. The ability to merge one or more PDF files can be handy in a number of different scenarios. Imagine, for example, compiling several reports into a single document, or dynamically creating PDF books for your customers based on specific chapters that they decide to buy. The merge operation can be performed on an arbitrary number of files (greater than or equal to two). The keepbookmark parameter allows you to maintain all the existing bookmarks from your source PDFs into the final result. While PHP has some powerful image manipulation functions provided by the GD Library, the latter does have some limitations. It is sometimes difficult to install, and the process of creating and manipulating the images can require multiple complex steps. If you happen to also have access to an instance of CF9, however, you can take advantage of its Image services for a set of easy-to-use manipulation functions that, while not as rich as the ones provided by GD, require much less effort, especially for simple tasks. As you can see, we can now determine the width and height of the image, as well as gather lots of information about its color model. As you can see, the process is fairly simple. All you need to do is specify a location for the image, its new dimensions, an interpolation algorithm and a blur factor; the latter is used to reduce resizing artifacts when the final image has a larger size than the original. Compared to the GD method of resizing images, the CF9 approach has several advantages. First, it’s a one-step operation, whereas GD requires multiple separate steps. Second, CF9 takes care of caching the output image for you, thus making caching repeated resize operations easier. While there are numerous open source libraries and free web services that can be used to generate charts, CF9 provides a truly powerful service whose functionality is hard to beat. For example, in addition to creating charts in a multitude of different varieties, the Chart service allows you to output in several formats, including as an interactive file in the form of an Adobe® Flash® movie that features mouse-over effects and animations. As you can see, despite the long list of parameters, all you really need to provide is one or more “chartseries” values, which are nothing more than a collection of data points in item/value format and a few specs on how those data points should be represented. The remaining parameters can be used to further tweak the chart’s appearance and manipulate items like its title, font characteristics, the visibility of grid-lines, and so on. This last example barely scratches the surface of CF9’s charting service has to offer. For example, you can actually create 3-D charts, or combine multiple graphs into a single image. Depending on the complexity of your project, CF9 can greatly enhance the look of your application, and provide your users with helpful visuals. There is a lot more to CF9’s Web Services offerings than what can be covered in this Refcard — for example, there is an entire service dedicated to e-mail. Luckily, Adobe maintains a comprehensive set of documentation for developers at http://help.adobe.com/en_US/ColdFusion/9.0/Developing/index.html. Complete documentation for all the Exposed Services can be found on the Adobe Help site at <=\"http://help.adobe.com/en_US/ColdFusion/9.0/CFMLRef/ index.html\">http://help.adobe.com/en_US/ColdFusion/9.0/CFMLRef/ index.html> both in a “live” web-based version and in PDF format.